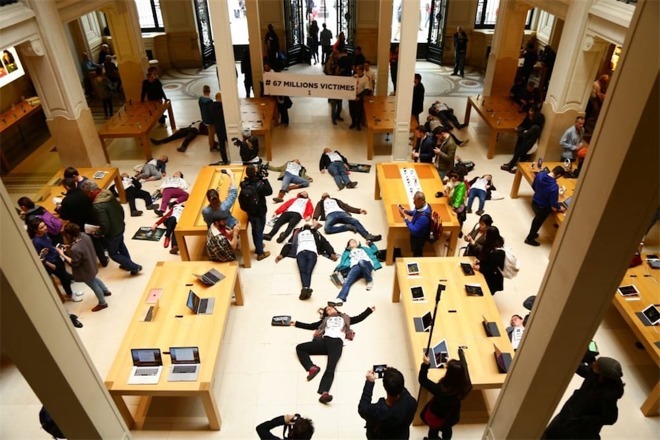 The Association for the Taxation of Financial Transactions and Citizen's Action —or Attac for short —staged "die-in" protests at two French Apple stores on Saturday, once again charging the company with exploiting loopholes to avoid paying its fair share of taxes. 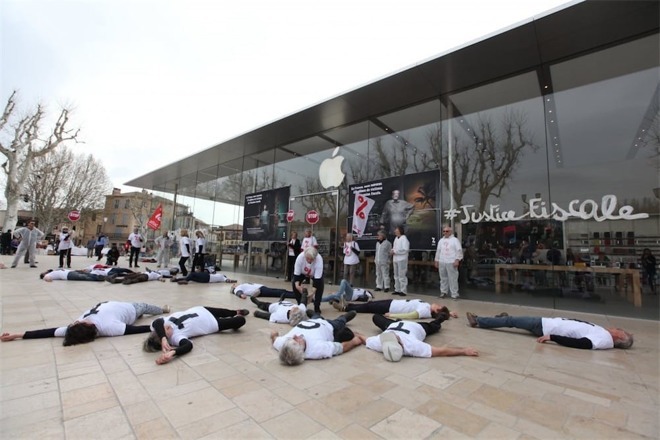 Around 70 members participated in an action at the flagship Opera store in Paris, while another 45 protested at Apple's location in Aix-en-Provence, according to MacGeneration. The "die-ins" involved people laying on the ground inside and/or outside of the shops, as well as signs and banners. "Legal or not, tax evasion is a scourge that plagues our democracies, greatly worsens deficits and serves as an argument for the weakening of public services and social protection," Attac said in a statement. Some of the signs argued that all the French people have been victims of corporate tax evasion, since public services like schools can be deprived of proper funding and forced to cut back or be privatized. Attac began its recent wave of pressure on Apple in December, launching protests at multiple stores. Apple in turn tried to sue the group for alleged damages and secure a three-year ban against future demonstrations, but this was denied when a court found that Apple couldn't identify any damages. At the heart of the dispute is Apple's use of Irish loopholes to pay minimal taxes on international revenue, something the Irish government allegedly catered to in a manner violating E.U. law. In August 2016 the European Commission ordered Ireland to collect back taxes, but the country has been slow to collect the $18.6 billion from Apple, and both the iPhone maker and Ireland are staging appeals. Proposed E.U. tax reforms could force Apple to start paying taxes in multiple European countries, rather than simply where its regional headquarters is located.